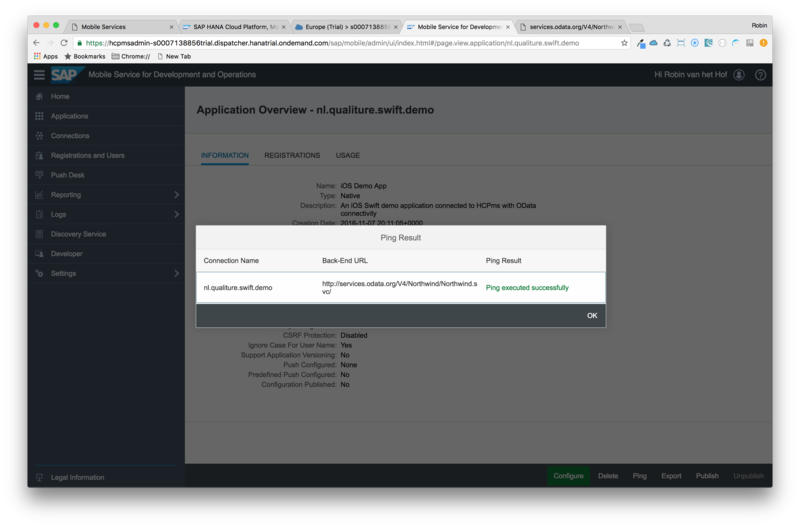 There are various blogs and resources describing how to build iOS applications with the Swift language, how to implement SAP Cloud Platform mobile services, and using OData REST services. However, after some research, I found no blog describing the full development process end-to-end using all three topics. This blog tries to fill that gap. 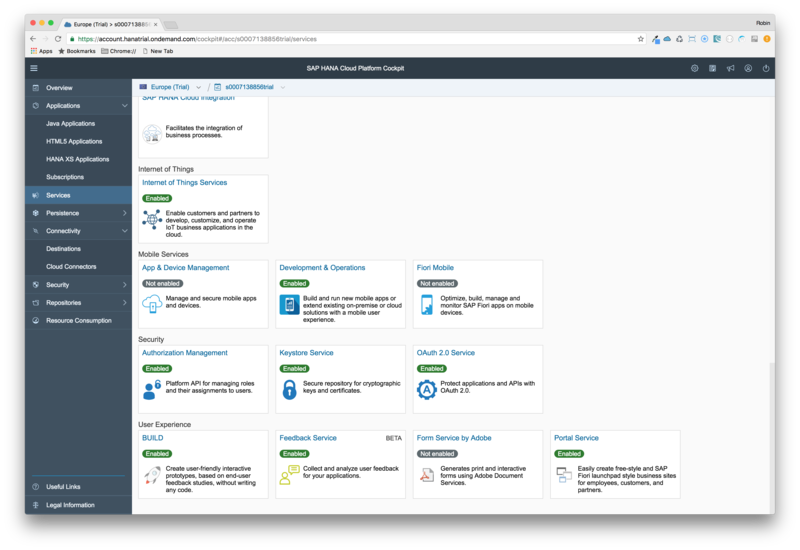 Does this blog already cover the announced SAP Cloud Platform SDK for iOS? 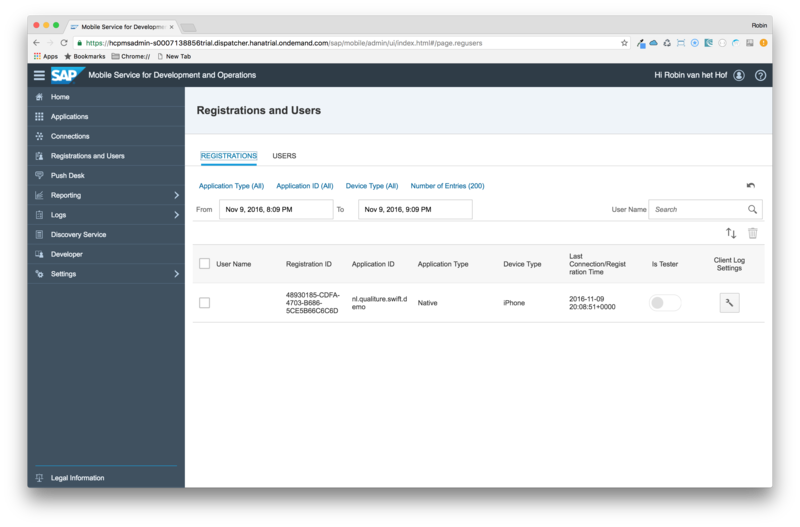 Both SAP Fiori for iOS design components as well as the SAP Cloud Platform SDK for iOS are still in development and not available yet. True OData support is not covered. I expect this to be available in the upcoming SAP Cloud Platform SDK for iOS. If it’s not yet enabled, enable it. Click the link Go to Service. Specify a unique Application ID (you will need these later) and Name. Click the Save button to finalise. For the purpose of this blog, we connect to the freely accessible and well-known Northwind OData service. Specify a Product Name (this is the name of your application) and Organization Identifier (i.e. package name). Specify a location to store your app. 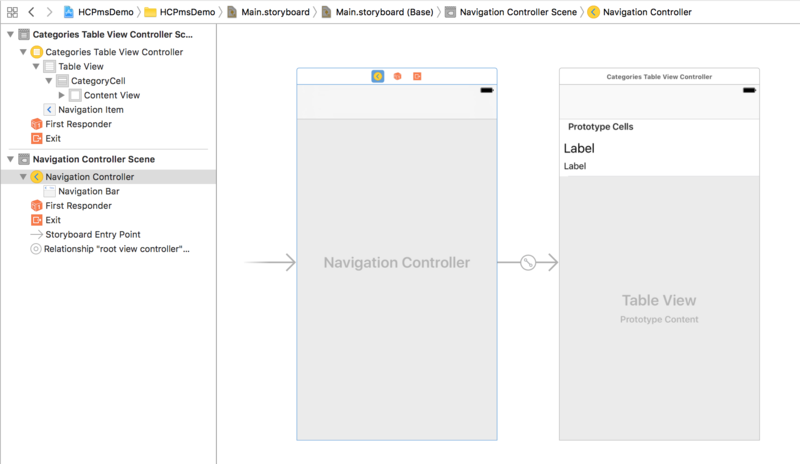 Most, if not all, application layout design is done via the app’s Storyboard. A Storyboard is the visual representation of your app’s user interface, screen, content, and navigation flow. 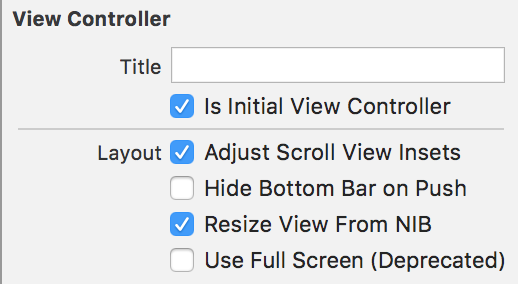 Select the View Controller in the Storyboard, and delete it. We now have a view, but not the actual implementing controller behind it. 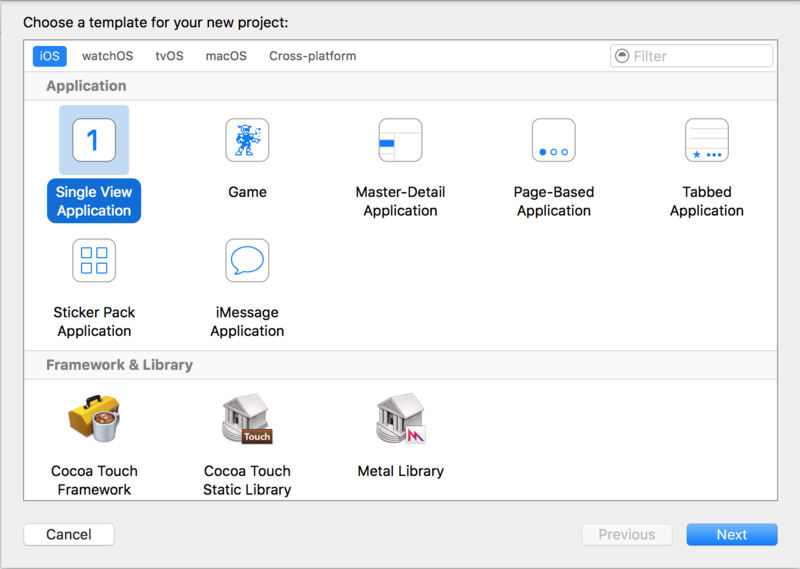 From the menu, select File > New > File… and select Cocoa Touch Class. Click Next, make sure it is saved inside your project, and click Create. 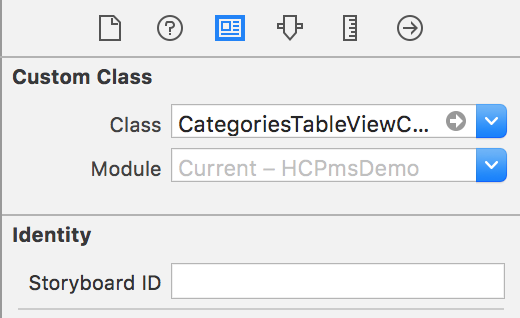 In the Storyboard, select the Table View Controller, and from the Identity Inspector at the top of the right pane, set the Custom Class to the just created CategoriesTableViewController class. 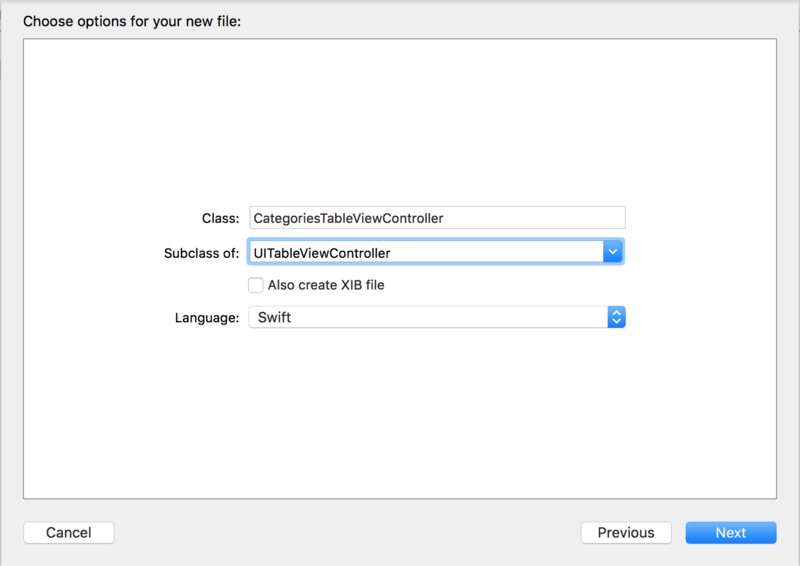 With the Table View Controller selected, switch from the Identity Inspector to the Attributes Inspector and tick the Is Initial View Controller checkbox. This will make the view the starting point for the application’s Storyboard. For convenience, we also create a custom controller class for the table’s cells. 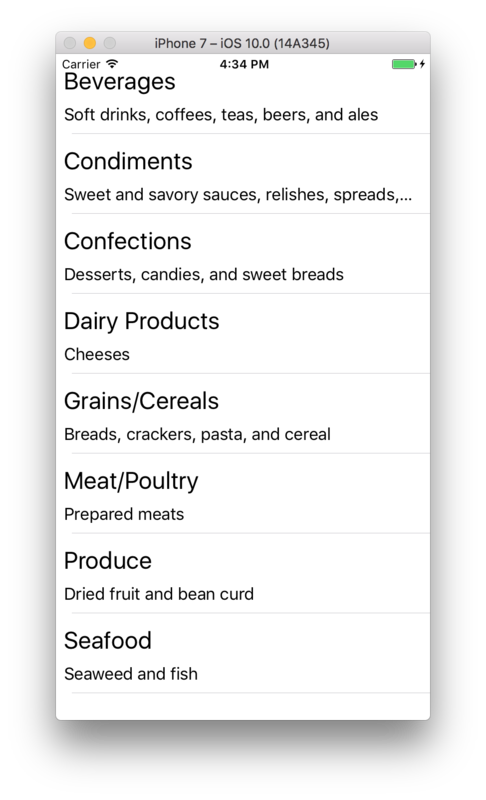 From the menu, select File > New > File… and select Cocoa Touch Class. 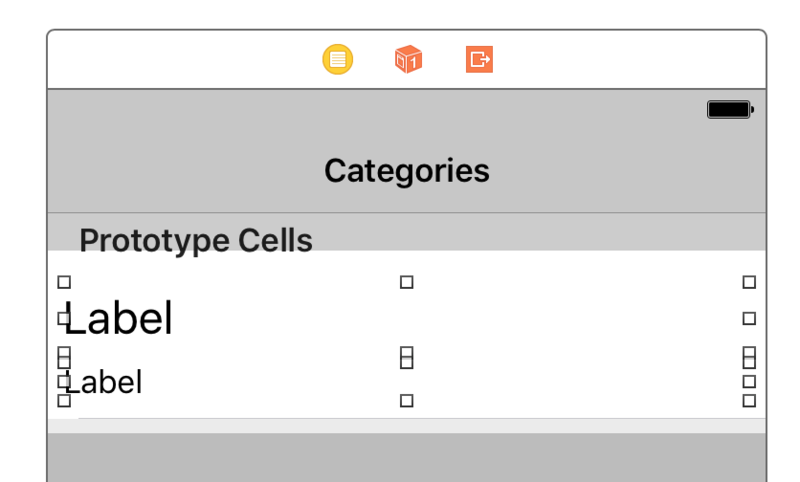 In the Storyboard, select the Table View Cell, and from the Identity Inspector at the top of the right pane, set the Custom Class to the just created CategoriesTableViewCell class. Now, we will design the table’s cell layout. For the purpose of this blog, we are going to query the Northwind’s Category entityset, and we want to display both the Category Name and Description in the cell. To accommodate these details, we need to adjust the table cell height, and add the controls to the table cell which will display these properties. This identifier is needed later in our code. From the Object Library, drag two Label controls to the Table View Cell, one on top of the other. Make them span the whole width of the table cell margin guides, and increase the top label font size to 24.0. In the dialog, set Name to nameLabel and click Connect. Do the same for the lower label; set Name to descriptionLabel. //  Created by Robin van het Hof on 09/11/2016. //  Copyright © 2016 Robin van het Hof. All rights reserved. @IBOutlet weak var descriptionLabel: UILabel! Of course, this makes perfect sense, since we didn’t create any connectivity to our datasource on SAP Cloud Platform Mobile Services. 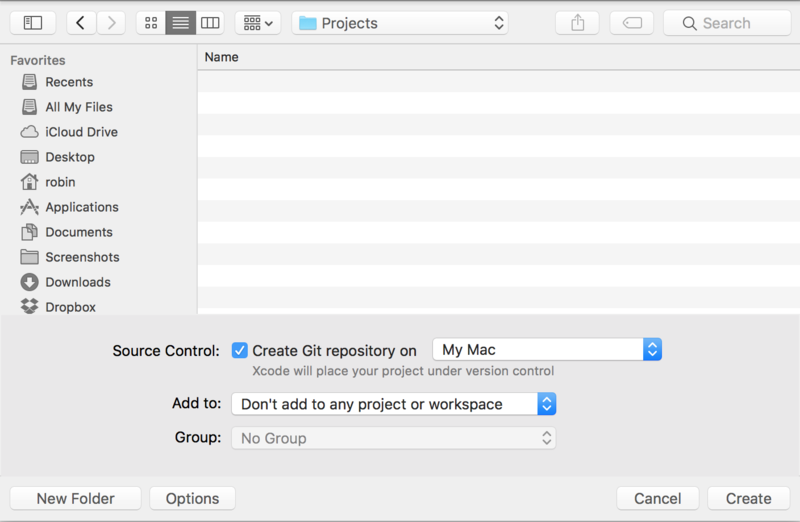 Close Xcode using Cmd-Q. It is important to have it fully closed before continuing! It will now add a dependency to your project for Alamofire. You will also note it will add (among other files) a <Project Name>.xcworkspace file. From now on, always use the workspace file instead of the project file to edit your project! 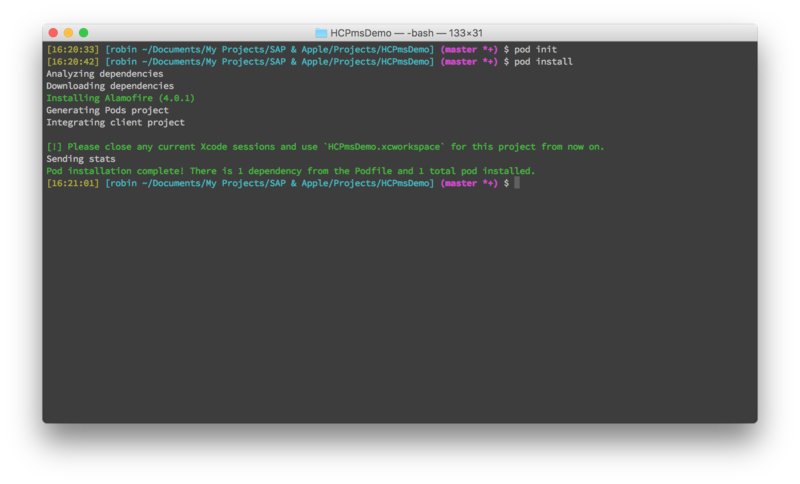 In Finder, double-click the file <Project Name>.xcworkspace to open your Xcode project workspace. Simply press Cmd-B to resolve the dependencies, and the error should be removed. 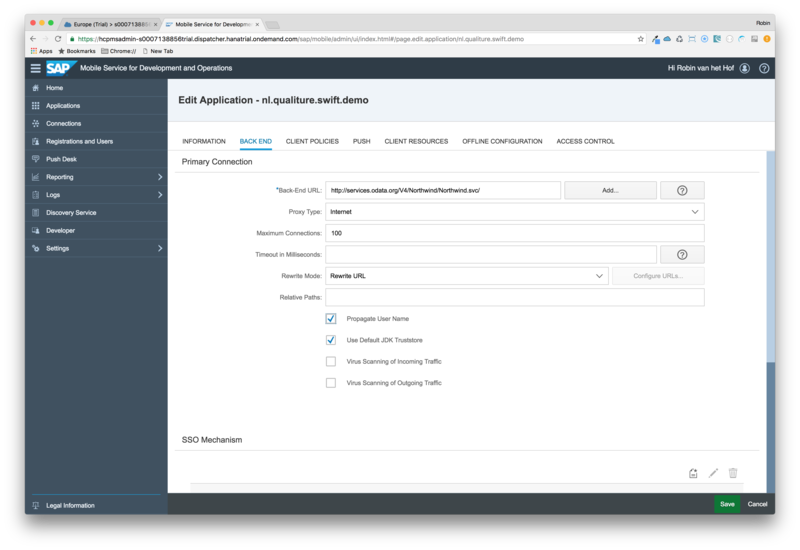 Since we will consume the Category entityset of the OData service exposed through SAP Cloud Platform Mobile Services, it is convenient to create a simple class to hold this data. 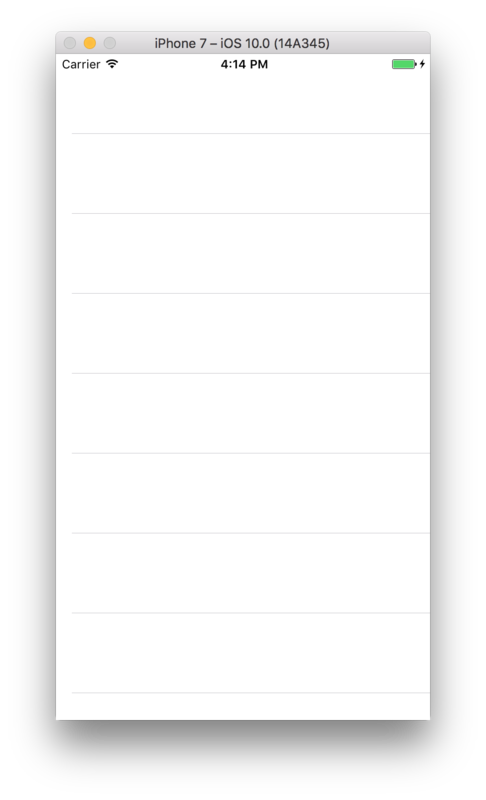 The last step is to implement the just created function loadCategories. A POST request will be performed to set up the connection and register the device to Cloud Platform Mobile Services, using the aforementioned HTTP Headers. The Parameters array is sent as payload in the request. If connected successfully, we can now perform the actual GET request to retrieve the Categories entityset. The categories array will be filled with the retrieved Category objects, and the table is reloaded to display the retrieved data. 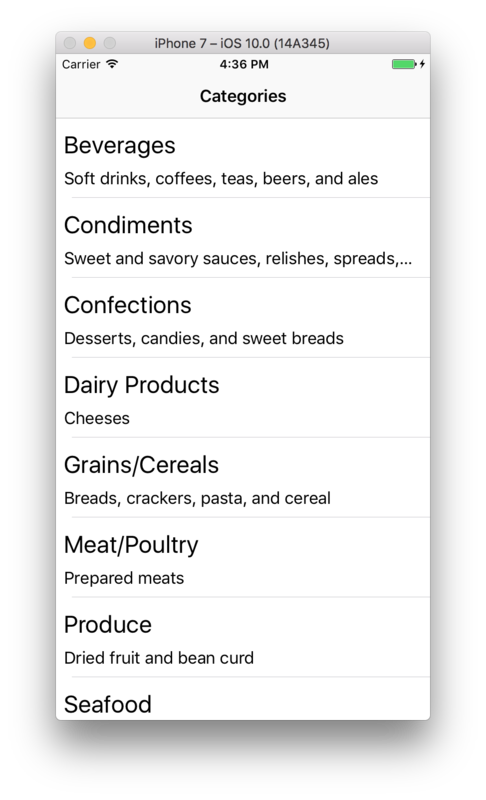 Select the Navigation Item, and change the Title to Categories. 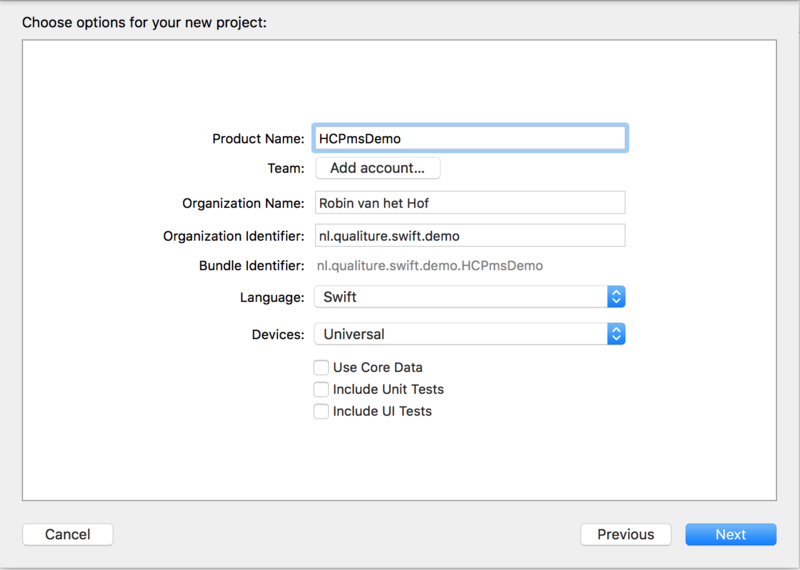 I hope this blog would enable you to jumpstart iOS Swift development using SAP Cloud Platform. 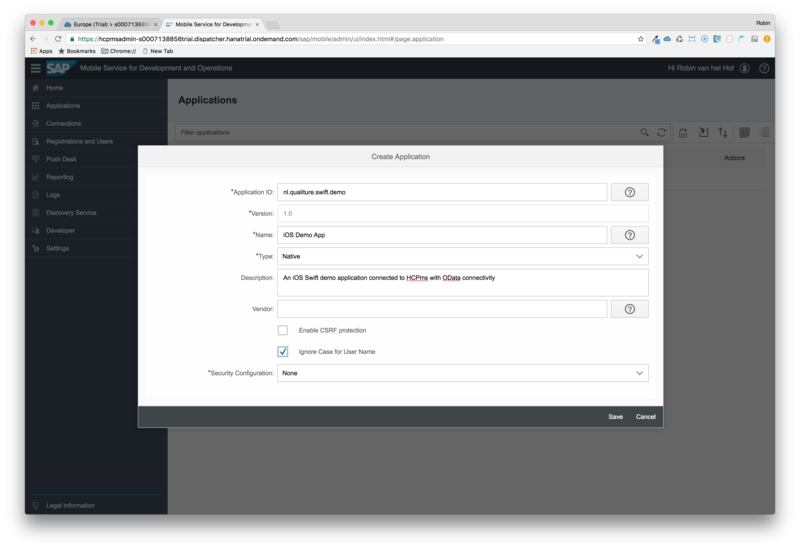 There is a lot more to discover — for instance, next to the Single View Application we used, there is also a Master Detail Application template — and hopefully you will be up to speed once the SAP Fiori for iOS or SAP Cloud Platform SDK for iOS are available in 2017. Robin!!! thank you for sharing this blog. It is very helpful and informative pal. what is theapproximate time of configuration vs actual developing? as a new developer in the ios world… I am seeing myself struggling more on the finding where stuff is .. so I was just curious on your experience. Thank you again for your share! 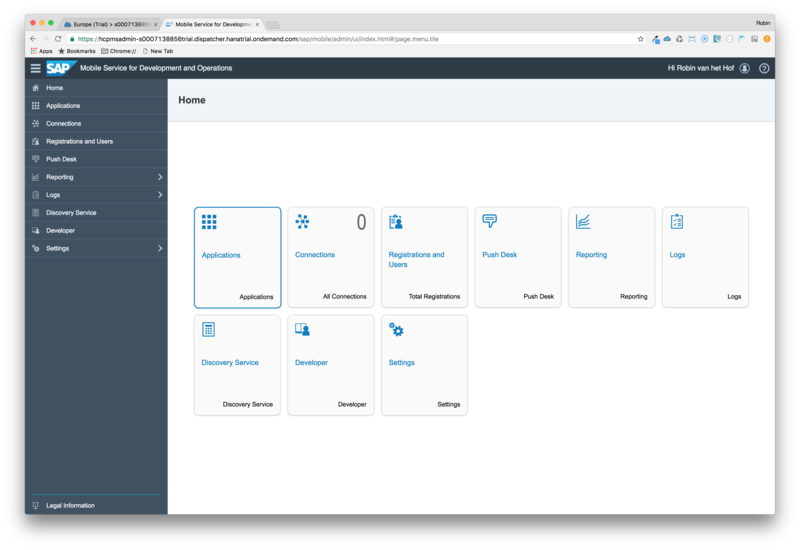 Actually, configuring HANA Cloud Platform, mobile services is pretty straightforward; didn’t cost me more than 5-10 minutes. 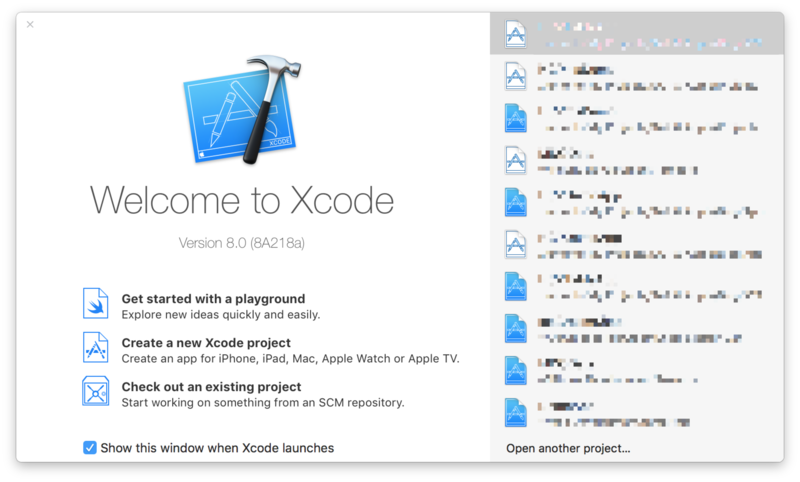 If you already have some Xcode knowledge, then you will be up to speed in no-time. 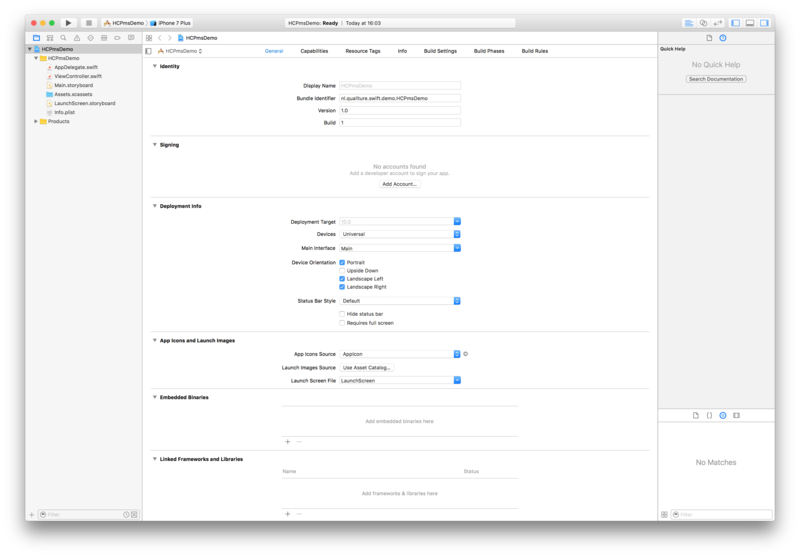 If Xcode and/or Swift is new, I can recommend follow Apple’s Swift Essentials and subsequent ‘walkthrough’ tutorial where you get to know everything about creating an iOS app using Swift. Another very good one is Stanford’s free Developing iOS 9 Apps with Swift classes via iTunes University. excellent blog, thanks for sharing this piece. 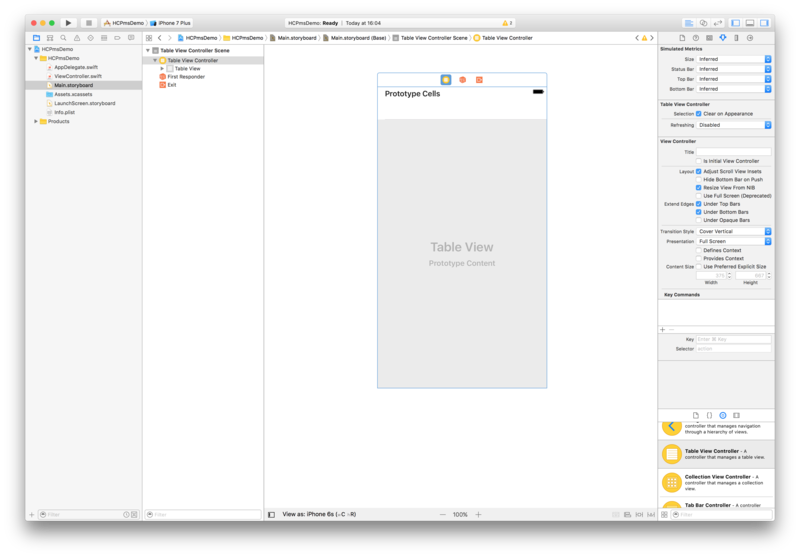 I had done some XCode iOS development before, even with cocoaPods, so managed to get everything created rather quickly. However I do not get any data into the app. Changed the URLs provided and the base64 encoded username:password (assuming this is username and password for the HCP trial). Any tips how to analyze the problem into more detail? 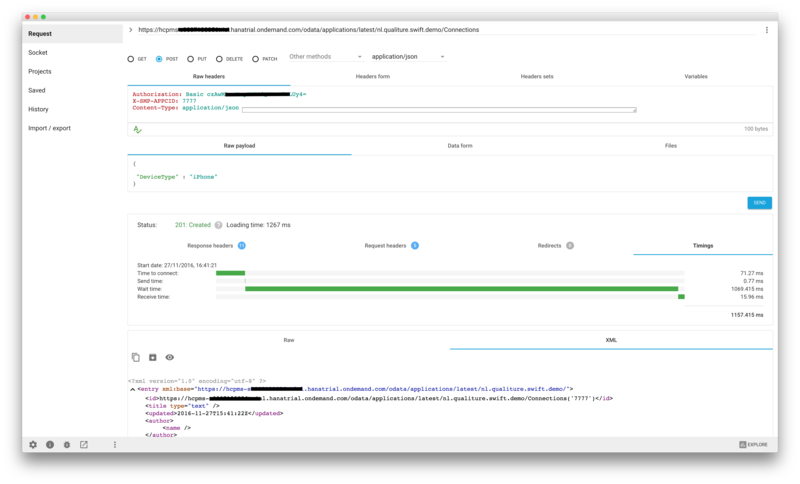 If the connection above is OK, and the subsequent GET request returns results, I would then try and set a breakpoint in your code and debug the response of the Alamofire.request call. thanks for taking the time to answer back. ARC was a good suggestion. My requests were working there so I already know that on the HCP side everything seems to be fine. Debugging the code in XCode I can see that the array gets published with the data from the HCP backend. What is not working though is the display of the data in the Table View. It seems it is not updated after the data has been received. Also, make sure you implemented the two overridden tableView functions in step 22.
thanks again. I had checked the code from step 22 a number of times and it was fine. The issue was actually the code foroverride func numberOfSections where my code was still returning 0 instead of 1. Fixed and working as expected now. Thanks a lot for sharing the tutorial on this, Already looking forward to an updated version of this thing based on the iOS HCP SDK for connecting to HCP once it becomes available next year. Thanks for this wonderful & comprehensive blog. I’m looking forward to work on IOS – HANA integration. I recently tried Android – HANA integration. Will surely try to implement this. How to get the authorization String which I have to replace?